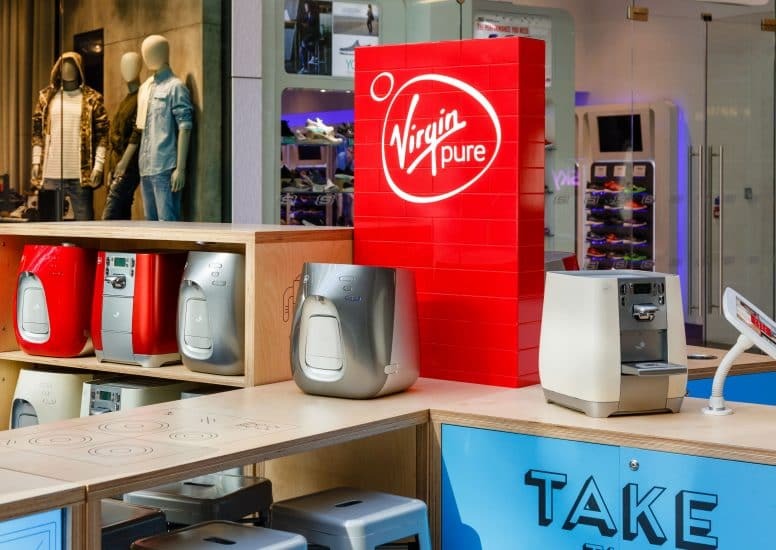 Here at D4R we have been working with the Virgin Pure brand, you may not have heard of this arm to the Virgin brand yet, but you will definitely see it popping up soon! 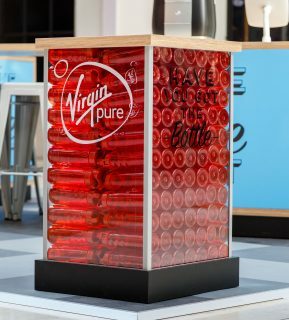 We were delighted to be given the opportunity to design, develop, produce and install Virgin Pure’s new retail kiosk to sell their Water Bar! 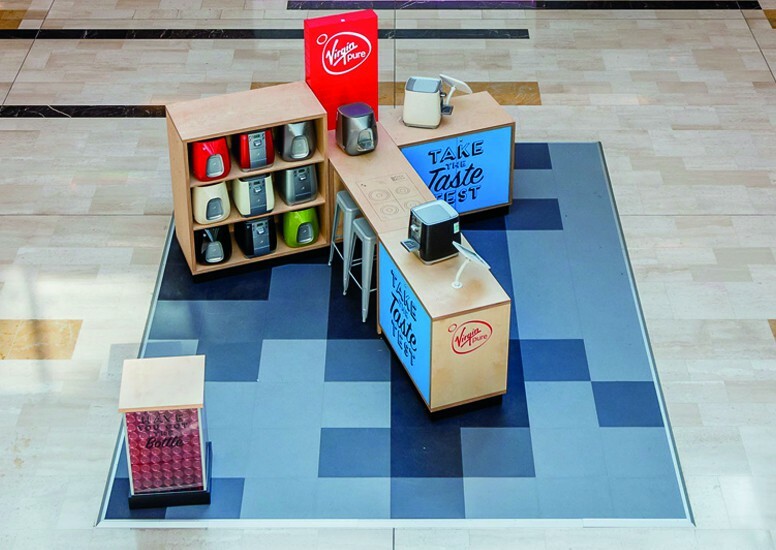 The kiosk will be travelling around shopping centres in London including Westfield White City and Stratford. The new kiosk features some key Virgin elements as well as some new quirky graphics created by our in-house designers. The iconic Virgin red monolith is the central focus of the kiosk design. The modular stand design has been inspired by kinetic water molecules and can grow to and contract to work in many different spaces depending on the location. 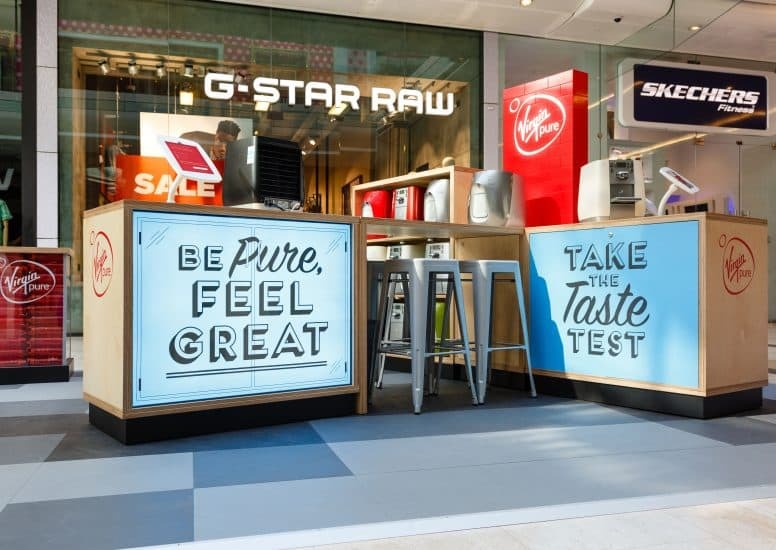 To ensure the kiosk stands out within the busy shopping centre environment, sign writer style illuminated graphics were created along with stylised kitchen appliance illustrations, adding a quirky Virgin twist to the graphics and messaging. A key design feature is the repetition of Virgin red water bottles filling a podium, an eye-catching detail that can’t be ignored. It is needless to say that every project comes with challenges and considerations but we always find a way to overcome them – incorporating them into the heart of the design! We had to ensure the stand design could be accessed from every angle, this led to an open design with an inviting layout which allowed shoppers to fully engage with the stand from any direction. 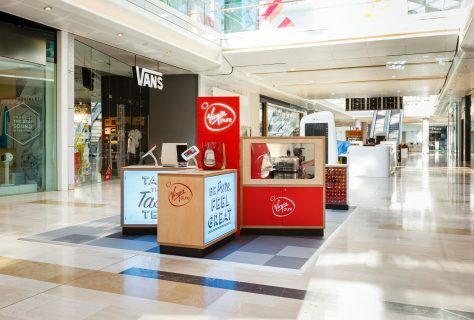 Working with the Virgin Pure brand has been a pleasure and we can’t wait to see the kiosk popping up in more shopping centres! Enter your details to receive our research + insight newsletter!